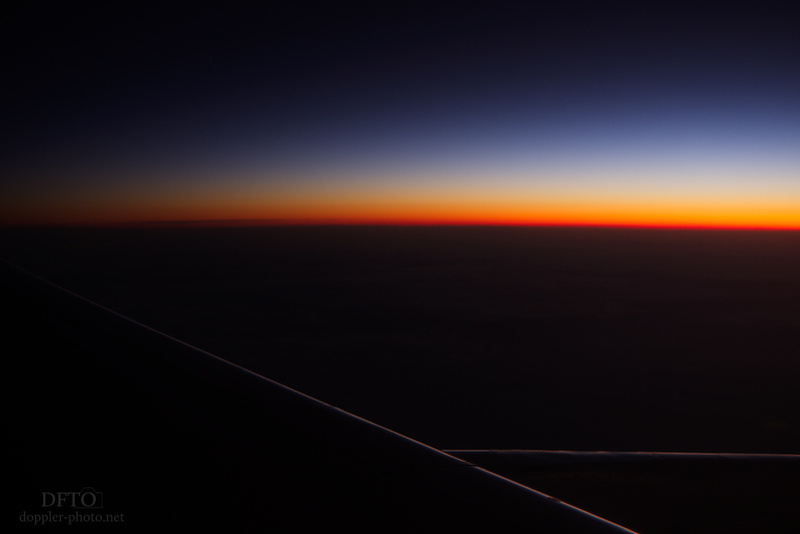 I mentioned before that I love the experience of just sitting on an airplane, and watching the world through a window. 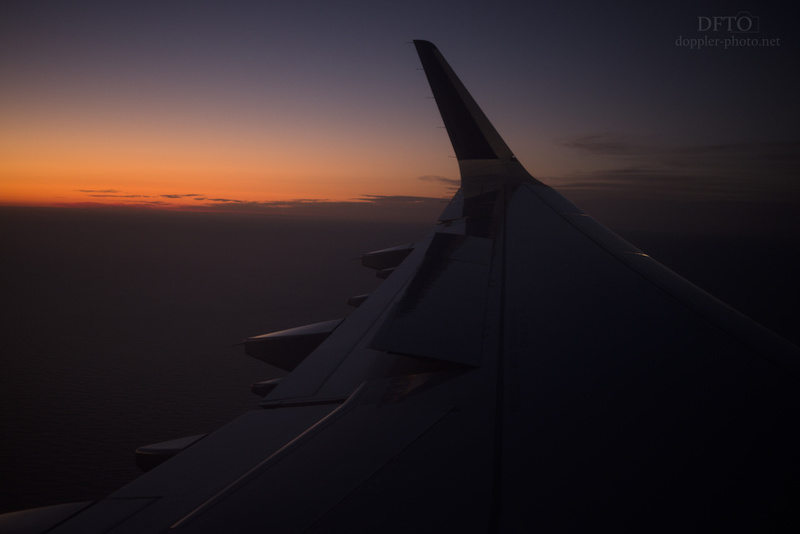 Regardless of which plane I'm on, or where I sit, my view out of the window always has the same basic framework: there's a wing that's always there. And everything else changes. I also mentioned that one purpose of photography, for me, is to find ways to express my curiosity about the world, and to share some of the details that delight me when I look around. Out of an airplane window, I'm often surprised at how quickly the view can change, even as the framework stays the same. 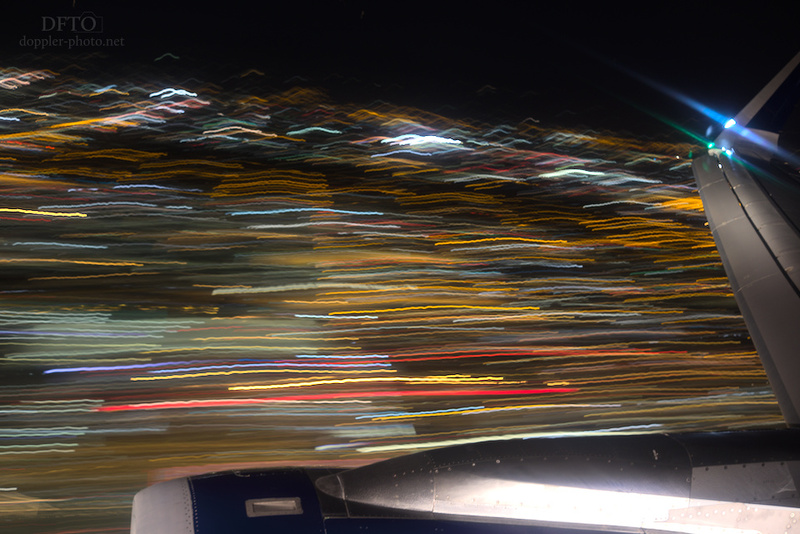 But just as often, what's surprising is how the details of the view can be so consistent, even as we move through the environment at hundreds of miles per hour. 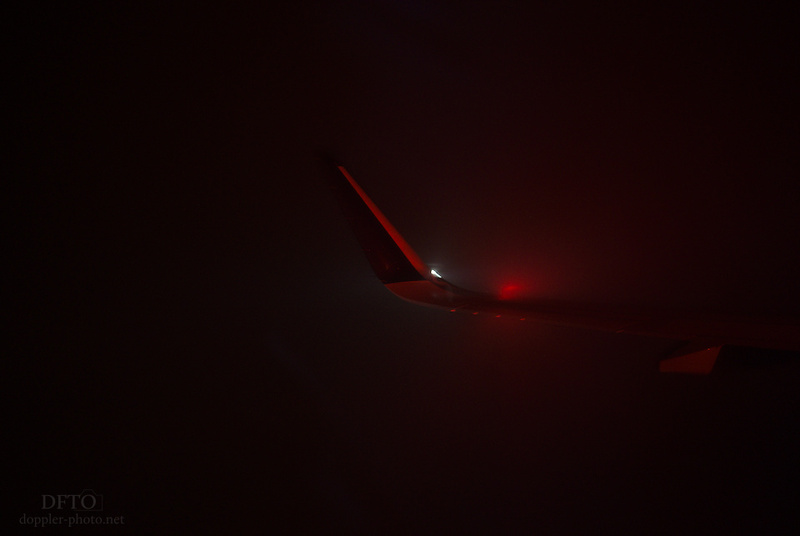 For me, red is the color of an overnight flight. 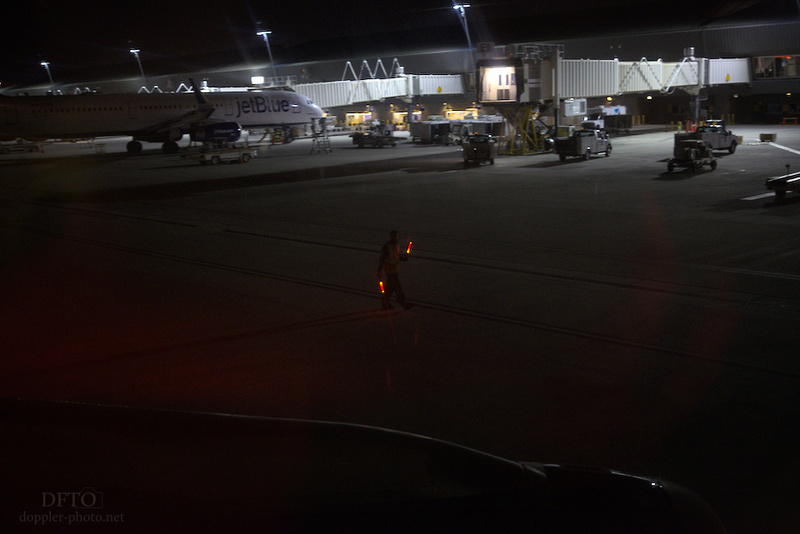 When you get on the plane, the ground-workers' batons are red. 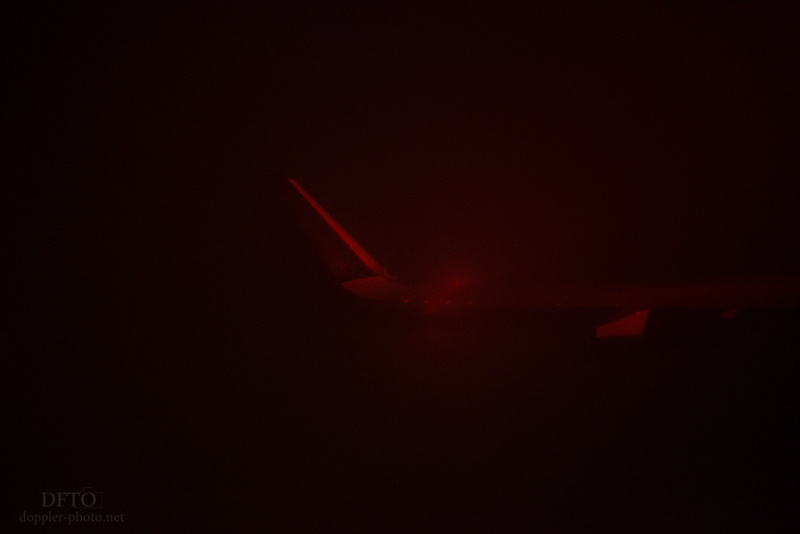 A faint red glow emerges from the underside of the plane and gently illuminates that taxiway. The beacon atop the plane is red. 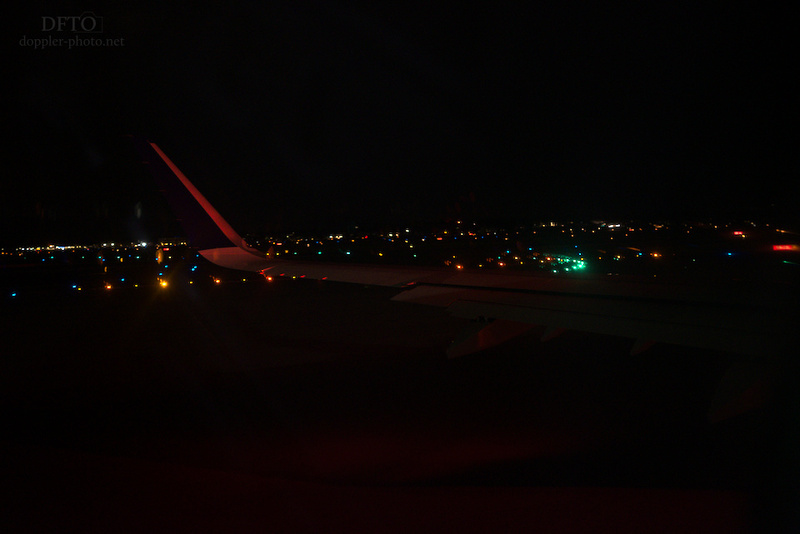 And sitting on the left (port) side of the plane, the navigation light is red as well. There are other colors too, don't get me wrong. But they're all other colors. You contrast them against the darkness that is everywhere, and the red that is everywhere else. At night, the colors and textures intertwine in a way that is equal parts wonderful and confusing. The predominant texture on an aircraft is smooth. And visually, "smooth" translates to "shiny." That shininess contrasts with the dull, matte appearance of areas that, for some reason, seem to have texture. Like when you pass through a cloud in just the right way, and when you watch at just the right moment. Things that looked super smooth on the ground now seem like they have some texture. And things that seemed pitch black when there was more ambient light seem to come a little more to life in the relative darkness. It's still a wing. Or, more to the point, it's still the same wing. But it looks different than it used to. And somehow, it looks like it would feel different as well. 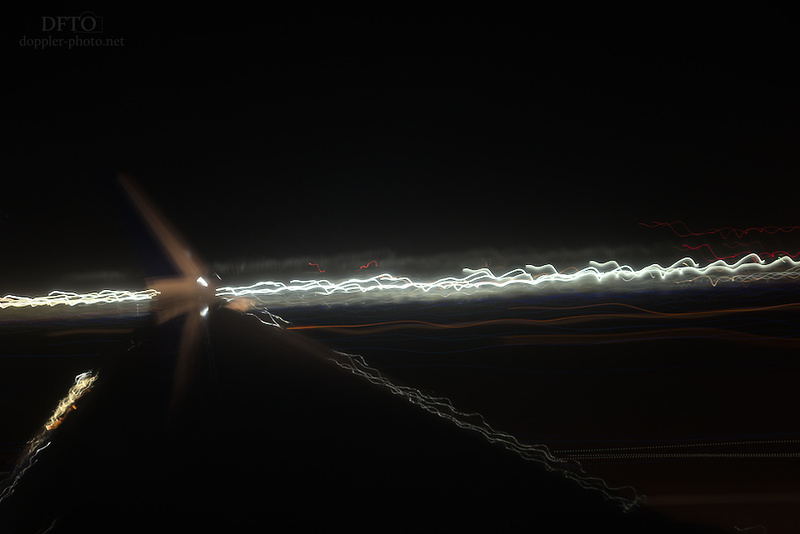 A few minutes later, I catch one of the strobes and everything changes again. The white light offers some crispness and definition to the wing-tip. The sudden contrast of textures and tones also reinforces the sense of redness in some ways. Before, it was like, "yeah, everything is red." But now, it's "wow, that red is intense, and the things that aren't red just look pitch black." Then as day begins to break, the wing shifts from red back to silver, as the horizon changes from black to a gentle, gentle red. The soft gradient of the early sunrise reflects off the gently curved components to make them look textured, even though they're smooth. As you look around the scene, the juxtaposition recurs — certain sections look like they're shiny, and others look like they're matte, even when they're made of the same material. Shapes and movement offer another source of fascination at night. And if you watch for lines, you're basically guaranteed to get a strong sense of both. 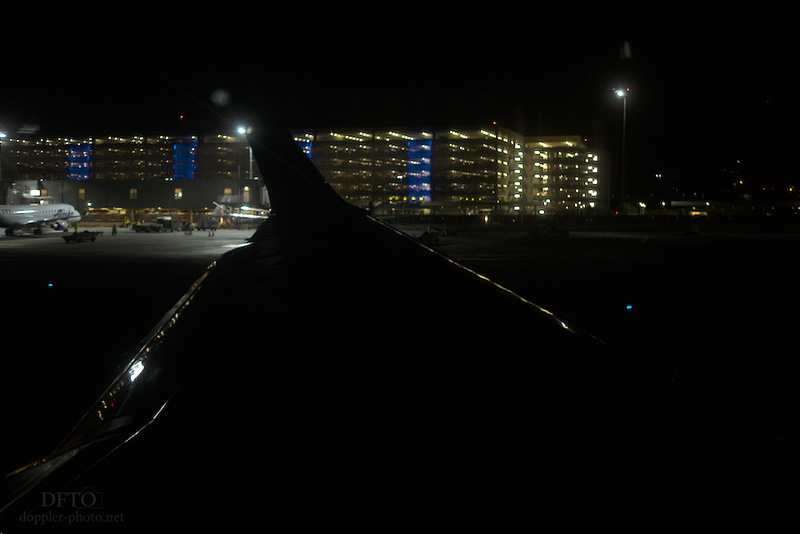 On the taxiway, bright, distant spots of light illuminate the edges of the wing (which, yes, are shiny). The steady movement outside of the window jumps every once in awhile, as the plane traverses an expansion joint in the tarmac. But generally, what you see is what you get — a brightly-outlined aluminum structure that is going to lift the plane into the air. At takeoff, things change. At least, that's what the lines will tell you. The people in the cabin vibrate. The wings vibrate. 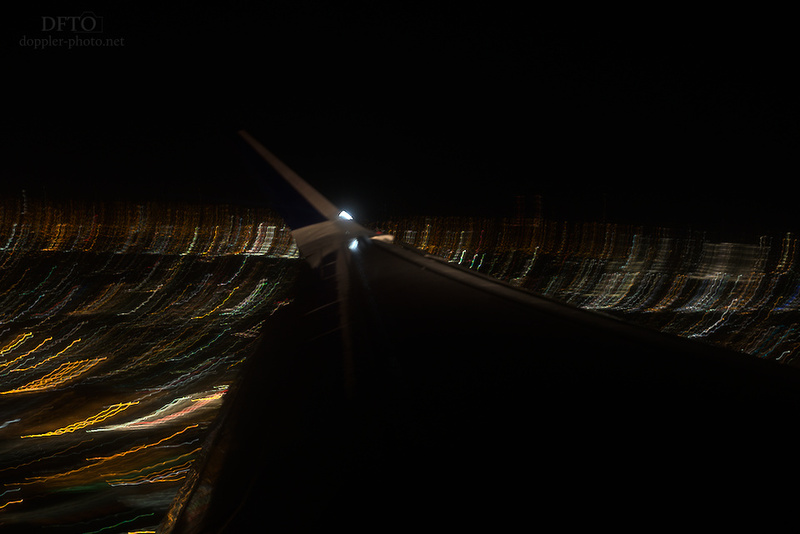 The entire plane spends a few dozen seconds in a state of transition, not quite mastering gravity just yet, but getting good and ready to make that jump. The lines tell you a story about the kinetic energy of the situation, and that the world is in flux. At cruising altitude, things generally calm down. 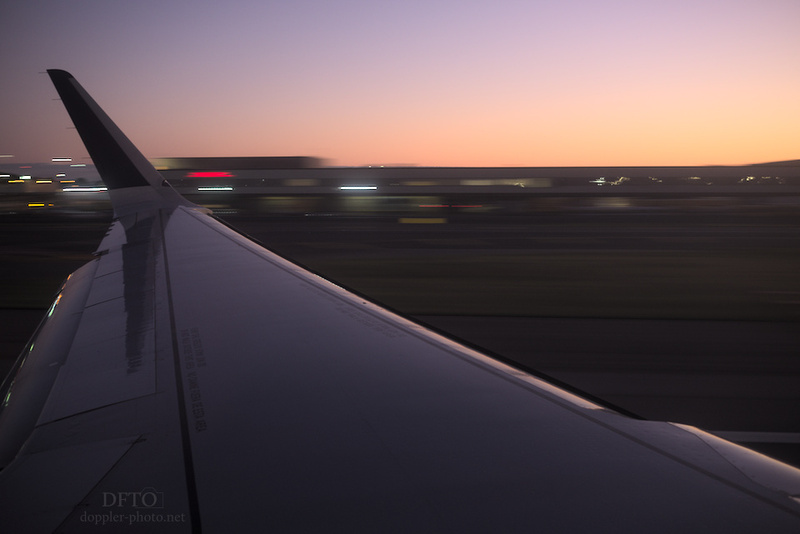 And as the hours tick by, a sense of tranquility replaces the turbulent storm of the takeoff. The cloudless morning sky gives a sense of simplicity. Of peace and order. 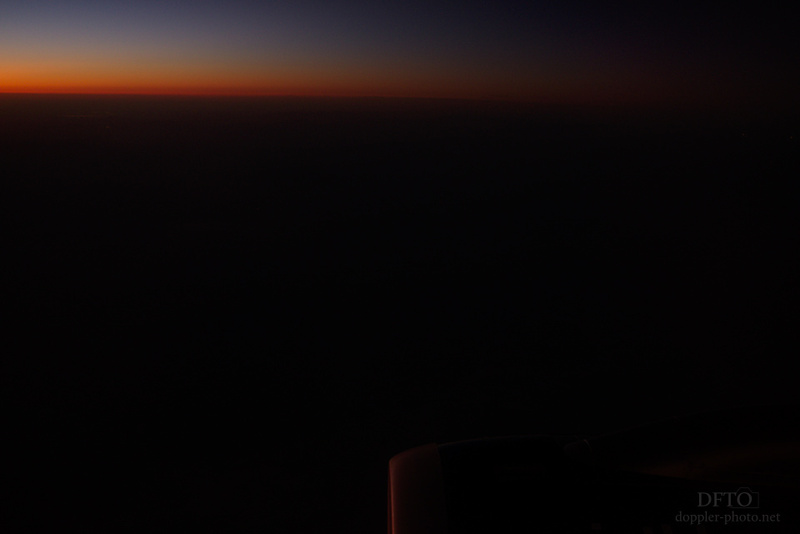 Still, at hundreds of miles per hour, but sometimes, it feels like you could just as well be sitting in a silent bathtub as the dawn's first rays peek above the horizon and spill out around you. Because as you descend from those heights, the turbulence will come back again.